Thanksgiving Packing Post 2016 + Special Announcement! I know many of us are traveling for the holidays, so every year I put together a fall packing list so that you don’t have to think very hard about what to pack! I don’t know if I’ll personally use this list because I’m still in love with last year’s list (see it HERE) and still have all of those pieces. Anyway, this list is is also made of pieces I love, and it is easily replicable for anyone else to do. Also, while this year’s list was made up of older pieces in my closet, it was a fun exercise create new looks from old pieces. I’ve been into more muted or pale colors lately, like blush and light grey, and it totally shows in these outfits! For newer readers, I started packing mini capsule wardrobes for trips because one year for Thanksgiving I packed in outfits in an attempt to not overpack, but none of my clothes went with anything outside of its designated outfit. Once I was on my trip, I absolutely hated the outfits I packed and didn’t want to wear them. Since nothing could go with anything else, I was stuck with the outfits I brought and hated. On top of that, I actually didn’t have appropriate clothing for some unplanned activities on the trip. For a week I was stuck with a suitcase full of clothes that I either didn’t want to or couldn’t wear, and I felt trapped with no options! Packing mini capsule wardrobes give me tons of options without overpacking. It’s the best! Instead of being limited to set outfits, I have a mix and match suitcase full of outfit options for whatever I want to or need to wear that day. 3 different colored bottoms – skirts, pants, shorts, etc. 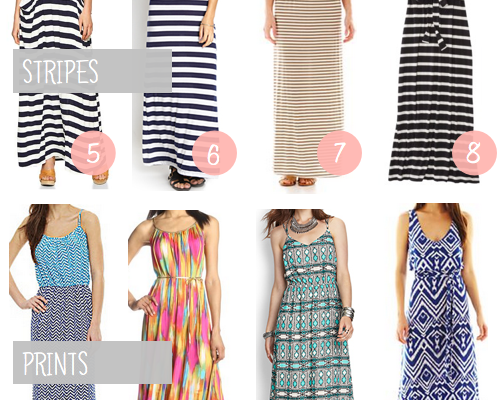 Each bottom needs to go with at least 3 out of 4 tops, but you’ll maximize your outfits if they each go with all tops. 3 completer pieces – The more different they are from each other, the more varied your outfits will look. For example, a vest looks and provides a much different feeling for an outfit than a cardigan while two cardigans of different colors might feel the same after a while. Not always, though! And if you don’t care as much about outfit variety then it doesn’t matter either. This year I went with a pullover sweater as my 3rd completer piece because I liked how it worked so much from last year. 2 pairs of shoes – I usually limit it to just 2, and in this case it’s a pair of riding boots and a pair of ankle boots. They’re both neutrals so I can wear either of them with any outfit. You could do ballet flats or two pairs of riding boots. Almost anything will work! A handful of necklaces – This year I think I only used necklaces pretty minimally. Instead, I relied on interesting color mixes and scarves to make my outfits more interesting. Duration: 7 days. I want to clarify that while this could be used for a 15 day trip, I personally would probably not use this list for a 15 day trip slotting one outfit per day. Using this list that way would only put you back in the trap of having set outfits and doesn’t give you margin for things to get dirty, not having the right outfit for the right occasion, or the weather not cooperating with your planned outfit for the day. For me the point of this is to have some options for those unexpected times, so I can be ready for getting spilled on, the weather changing, or unplanned activities–without packing half my closet for all of those “just in case” events. I would pack this for a 7-10 day trip, but not a 2 week trip. For a longer trip, I would pack 1-2 more tops which will go a very long way. Also, maybe one more completer piece, like another cardigan or another pullover sweater. I don’t really have favorites this year, just maybe 4 un-favorites. 😛 I love the muted color palette on this one and especially love the lighter windowpane scarf! Like I’ve said before, it keeps outfits bright while still looking cozy. 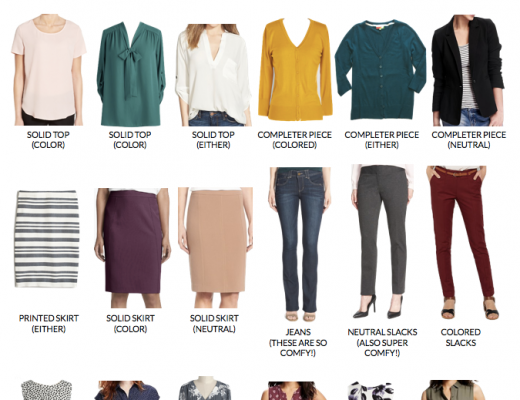 Special Announcement: Extended Capsule Wardrobe + Outfits Coming! If you like posts like this where I give you a list of pieces and show you a bunch of outfits, then keep your eyes open during the next few weeks! I’m excited to tell you that I’ll be launching a Style Challenge program that you can buy into (for you or as a Christmas gift for a friend! or both!) that will provide you with tons of outfits and even tell you when to wear what each day. It will provide you with way more details to help you put together your Style Challenge capsule (and ultimately a cohesive wardrobe) with as many pieces as you can draw from your own closet. But, if you need or want to add any to your closet I’ll also provide several alternatives for each piece instead of just one or two options like I give in these posts. There will also be some giveaways that only Style Challenge members get access to! More details will come as it gets closer, but I wanted to give you a heads up to stay tuned! For all One Piece Many Ways posts, where I take one item and style it several different ways, click HERE. These are some of my favorite posts that you do. I do travel for the Thanksgiving holiday and have used your post in past and was wonderfully happy with the results. First was the 2014 version and I happened to have very similar pieces and followed it (as a beginner) nearly to the letter with the exception being that I did not require a dress because it was a very casual trip. My favorites looks this year are 2, 6, 12, and 15. I too love the soft neutral palette this year as it’s relaxed and easy to mix and match. One future post I would love to see is “cozy pajama/lounge wear/athleisure” ideas. I stay with family and we all love to hang out in our comfy clothes in the evening around a movie or board game. I have read lately of the idea of using a cozy soft oversized cardi as not only a completer piece but also a lounge wear topper and I loved that idea. Do you have any other great ideas for working this into a “holiday capsule pack”? That is so awesome to hear, Suzi! How encouraging! I was thinking about a little more athleisure, though not necessarily cozy pajama and lounge wear quite as much. 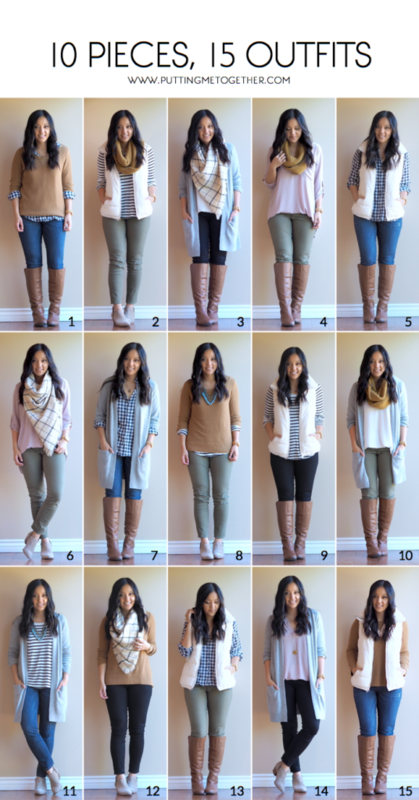 Next week I’m doing a post on 3 outfits with leggings that are exactly outfits 3 and 9 here with leggings. 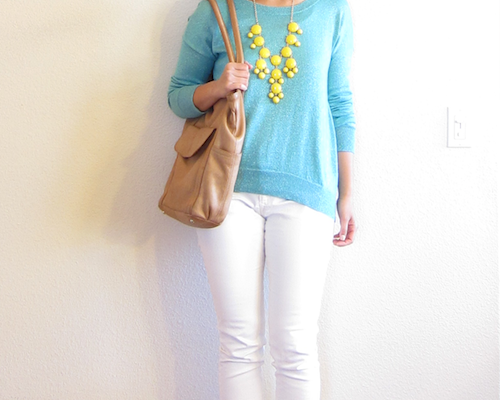 For #3, instead of the white blouse, a normal white long sleeve tee can be used. Another leggings outfit involves a longer plaid button up tunic, and you can wear a cozy cardigan or the vest over it. The oversized cardi in this post is very soft and could definitely be used as the lounge wear topper, which is how it’d be used un outfit #3 here with leggings. So maybe instead of black jeans use leggings. And instead of the navy gingham (or in addition to the navy gingham) use a long plaid tunic length top. And make sure the striped tee is tunic length as well. I’ll be posting options for all of those next week in my leggings post too! Thanks Audrey for all the great ideas! I never thought about leggings as my pj’s and as outfit pieces. Duh?! : ) This will work perfectly. I’m off to rummage through my closet to make this work. Looking forward to your tunic length tops. Have a great Thanksgiving with your beautiful family! Ooohhhh! Excited about what’s to come! Love this post. It’s right on time. I was just wondering what to pack for our 6 day Thanksgiving trip. Seems I always put more work into the kids and their outfits than into my own and I’m left feeling frumpy. Just wanted to say thanks so much! Your suggestions came right on time! I just bought some burgandy pants…it’s out of my comfort zone of blue jeans, but your site has been so encouraging that I’m going to give it a try! This is such an amazing idea! So functional! I love it and am so excited about what’s to come! I’m going to sub in my burgundy jeans for the olive ones though I think. I was bummed that the blush color in the Lush blouse is no longer available. About the blush Lush blouse–I knowwwww. 🙁 I don’t think I’ve see it in stock since it was first sold at the NSale last year. Such a shame because that color is really in right now! I so enjoy these posts! I just realized instead of JUST reading them I should go and pull out all my similar items and actually see how many I can recreate! Thank you!! I am waaay behind because I was super busy lately and am now catching up on your blog posts. The packing list is great, as always – like everyone else I love these! I used your formula for a short trip back in October – my husband was pretty surprised when he saw the mini pile of clothes I packed 😀 But I wore the bulkiest pieces for travelling and didn’t need much because everything could be mixed and matched 🙂 So a total winner. I’m a bit confused about the usage of pullover sweaters though. I look at them as tops rather than completer pieces, because most of the time you don’t see what’s under them, or at least that’s true for me. And on the other hand you can’t wear many completer pieces over a pullover sweater, except vests. So they’re not very versatile – and then again much needed in a colder climate like where I live! I’m so encouraged to hear that you used the packing formula! Pullovers are kind of in between for me. I use them however they work and try not to think too hard about which category they fit in. I do think some of them work under a blazer, in addition to a vest like you mentioned. But yeah, not under a cardigan or anything like that.